Portable speakers let us enjoy our music wirelessly at home and on the go. And with the smaller, more powerful and longer lasting models offered recently, it's no wonder everyone wants one. Back when Ultimate Ears introduced the UE Boom more than a year ago – the cylindrically-shaped $200 speaker most known for its durable svelte design and immersive 360-degree sound, the company really impressed us with its advanced portable speaker design. So much so that it was worthy of our Editors' Choice Award. The only thing that held us back from giving the UE Boom the highest score possible was that it didn't quite have enough bass under the hood. Despite that, the UE Boom was considered as one of the best portable speakers at $200. But since then many companies like JBL released drastically improved offerings that surpassed the UE Boom's once firm reign over the portable speaker market. Fast forward to present day, Ultimate Ears used its legendary portable speaker design chops to craft the UE Megaboom, the step-up speaker for people who loved the UE Boom but wished it offered more oomph in the bass department. Its a strikingly familiar looking portable sound producing gadget that promises to deliver ridiculously amazing 360-degree worth of sound with deep bass and magical unicorns thrown into the mix. Okay, maybe the latter isn't true. But everything else is. Or so Ultimate Ears claims. So let's get to it, our full and in-depth review is waiting for you after the break! Bose is back with its second highly portable wireless Bluetooth speaker called the SoundLink Color. Not to be confused with the more premium aluminum-made SoundLink Mini, this isn't quite yet the successor to one of the greatest portable speakers ever made, but instead a more affordably priced and colorful addition to Bose's growing lineup of wireless speakers. Offered in white, black and three other vibrant colors to match your style, the SoundLink Color has a compact form factor and boasts a quirky new original design we haven't yet seen before, and up to 8 hours of battery life. Like the SoundLink Mini, the new SoundLink Color features dual passive bass radiators and dual dynamic drivers that Bose claims produce clear, full-range balanced audio. As always, we're going to put it to the test to see how the SoundLink Color compares to its more expensive metallic brother as well as a few other noteworthy portable Bluetooth speakers. Our full and in-depth review can be found waiting for you just below this bit of text. JBL recently updated one of its most sought-after portable speakers with the second generation Charge 2 portable wireless Bluetooth speaker. If you thought the original award-winning Charge speaker sounded good, wait until you hear the Charge 2 in action. It has been outfitted with larger, better dual 45mm drivers and a pair of passive side-firing radiators for that much needed special delivery of bassy low-end goodness to liven up your music experience. With the addition of improved internal hardware, the Charge 2 has been redesigned to look sleeker than its predecessor with a more contemporary design along with a more polished build quality. JBL's Charge 2 still features the same useful added features like the ability to charge external portable devices while you're on the move, and make hands-free speakerphone calls thanks to a built-in microphone with noise and echo-cancelling technology. The Charge 2 sounds like a worthy successor, but is that enough to compete with today's leading portable Bluetooth speakers? Let's find out! The thing about portable speakers is that while they make listening to music super conveniant and more social in a mobile lifestlye, most of the ones that you can actually carry around with you willingily aren't capable of providing a that low-end bass you otherwise hear when listening to a large speaker setup, which typically means you can't fit that kind of audio gear into your backpack or move it around as effortlessly as a more compact portable speaker like the $150 JBL Charge 2 and many others. 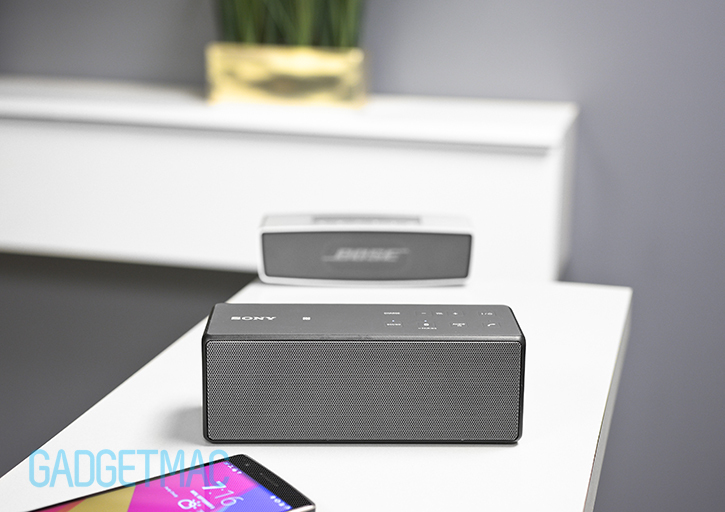 We do know of one such device capable of delivering a convincing amount of bass while still being an extremely easy to carry wireless speaker, and that's the Bose SoundLink Mini. It wasn't until recently that we had trouble finding a portable speaker that was as small as the SoundLink Mini and that could also match its outstanding level of audio richness. We're talking of course about Sony's SRS-X3. As of today, we think that it's Sony's best sounding portable Bluetooth speaker you can buy that's as moderately sized as many other highly popular and noteworthy alternatives such as the UE Boom, JBL Charge 2 and the Bose SoundLink Mini itself. Sony is clearly taking a jab at Bose with its similarly specced and more competitively priced SRS-X3 speaker. Can Sony's $150 SRS-X3 beat the more expensive $200 SoundLink Mini at its own game? Find out which of these can drop a more satisfying bass punch in our full review and comparison down below! NudeAudio has got a brand new speaker to share with us all, and like many companies these days, NudeAudio is using Kickstarter to fund its new product and create lots of buzz in the process. The Super-M is NudeAudio’s latest portable speaker offering that promises super-high sound performance in a very small and waterproof package that you can slip inside your back pocket. It’s reasonably priced too. Per NudeAudio’s brand philosophy of creating good looking speakers that sound good and not much else without the premium price, the Super-M is the first $100 ultra-portable speaker we’ve come across that is reasonably priced, yet still features a surprisingly promising 6-speaker driver array capable of outputting a compelling 360-degrees worth of audio – all packed into a resilient IPX5-rated waterproof construction that is hardly over an inch thick. This might be NudeAudio’s best speaker yet. If you’re looking for an inconspicuously strapping pocketable Bluetooth speaker this might be your lucky day. Be sure to get filled-in with our full review down below! NudeAudio is an up-and-coming audio brand, and it's serious about making affordably priced portable Bluetooth speakers look and sound great too. And it does so without spending all of its audio engineering and speaker design budget on marketing. NudeAudio's Bluetooth speaker lineup consists of two very pocket-friendly speakers including the Move S and Move M, as well as a larger Move L speaker model (above), which balances indoor and outdoor portability prowess along with the suitable horse power to help it deliver that extra kick some of you are looking for. One thing NudeAudio's portable speakers all have in common is an 8-hour rechargeable battery and a travel-friendly, contemporary design that utilizes a protective shock-absorbing silicone bumper-like outline and a neat, colorful built-in lanyard cord. NudeAudio sent us two of their greatest wireless speaker offerings to have a look at – the mid-level Move M and the higher-end Move L. We will be reviewing them both in two separate reviews where they'll each have to face a rigorous comparison test. So make sure to check out the Move M review here, or jump past the break for our full review on the Move L! NudeAudio is an up-and-coming audio brand, and it's serious about making affordably priced portable Bluetooth speakers look and sound great too. And it does so without spending all of its audio engineering and speaker design budget on marketing. NudeAudio's Bluetooth speaker lineup consists of two very pocket-friendly speakers including the Move S and Move M (above), as well as a larger Move L speaker model which balances indoor and outdoor portability prowess along with the suitable horse power to help it deliver that extra kick some of you are looking for. One thing NudeAudio's portable speakers all have in common is an 8-hour rechargeable battery and a travel-friendly, contemporary design that utilizes a protective shock-absorbing silicone bumper-like outline and a neat, colorful built-in lanyard cord. NudeAudio sent us two of their greatest wireless speaker offerings to have a look at – the mid-level Move M and the higher-end Move L. We will be reviewing them both in two separate reviews where they'll each have to face a rigorous comparison test. So make sure to check out the Move L review here, or jump past the break for our full review on the Move M!